These recent regulatory initiatives are significantly impacting the global fire suppression market, since the HFCs used in fire suppression have some of the highest GWPs relative to other sectors. 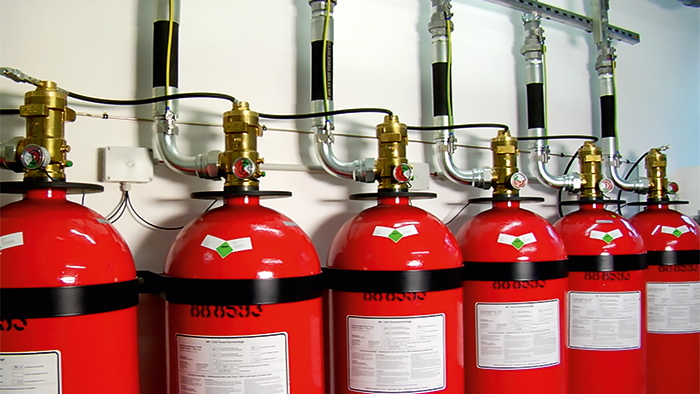 HFCs are particularly commonplace in the Middle East fire suppression market, and this article examines alternatives for those seeking a more sustainable approach to fire protection. Under the HFC cap and phase-down, HFC-producers are allocated a production/import quota for HFCs and are having to make difficult decisions. Because the quota is in CO2 equivalent and HFCs sold into the fire suppression market have some of the highest GWPs, this framework does not favor HFCs sold into fire suppression. For example, an HFC producer would consume the same percentage of a quota by making either one ton of HFC- 227ea, three tons of HFC-245fa, or five tons of HFC-32. This dynamic is putting a substantial amount of uncertainty on the future supply and cost of HFCs sold into fire suppression. Fortunately the fire suppression market already has cost-effective substitutes available, which will be discussed later in this article. Following suit, the U.S. Environmental Protection Agency (EPA) has changed the status of HFCs to unacceptable for specific uses under the Significant New Alternatives Policy (SNAP) programme. This is based on data showing that other substitutes are available that pose lower risk overall to human health and/or the environment. On 15th October 2015, HFCs were again on the agenda at the White House when senior officials met with industry leaders to recognise progress in curbing emissions of HFCs. The meeting also included a new set of private-sector commitments and executive actions that are predicted to reduce cumulative global consumption of HFCs by the equivalent of >1 billion metric tons of CO2 by 2025. To put simply, this is equivalent to taking 210 million passenger vehicles off the road for a year. In November 2015, Dubai was host to the 27th Meeting of the Parties to the Montreal Protocol. At this meeting Parties decided to form a “contact group on the feasibility and ways of managing hydrofluorocarbons (HFCs)” – putting the production of HFCs on a path for a global phase-down that is set to be negotiated in 2016. Dr Rashid Ahmad Bin Fahd, Minister of Environment and Water, welcomed the meeting, and in his speech, told delegates how UAE has taken necessary measures for the preservation of the ozone layer, including studying HFCs. The minister reiterated the UAE’s commitment to the goals of the Vienna Convention for the Protection of the Ozone layer and the Montreal Protocol, which originally came into force in 1989. HFCs are certainly on the global agenda and the framework for the global agreement is such that purchase decisions today will likely have cost consequences well into the future. Given that fire suppression systems can easily be in situ for 30 years, these cost of ownership issues are important considerations. HFCs used for recharging existing systems, or in the installation of additional new HFC-based systems, will be increasingly impacted by the phase-down schedule. Associated costs are anticipated to be disproportionately impacted for the fire suppression sector because the HFCs sold into this sector have some of the highest GWPs. Suddenly those purchasing HFC-based fire suppression systems will not only face immediate price consequences, they will also need to be aware of other future issues such as system recharge costs and potential end-of-life costs when a system is ultimately decommissioned. All that can be stated with certainty is that the future cost consequences for HFCs is uncertain. So, what are the alternatives to HFC based systems? Water, most often viewed as the most ‘natural’ fire suppressant, is certainly safe for human life, and is an effective choice in some environments. However it is not suitable for spaces that contain sensitive or delicate equipment because it can cause electrical short-circuiting and/or permanent damage to components and disruption of continuity of operations. Also, water-based systems cascade downwards (two-dimensional) and, therefore, these systems are not effective at protecting in 3 dimensions, i.e., where water can’t be directly applied to the fire. Clean-up following discharge is another consideration, with a need to dispose of contaminated water. 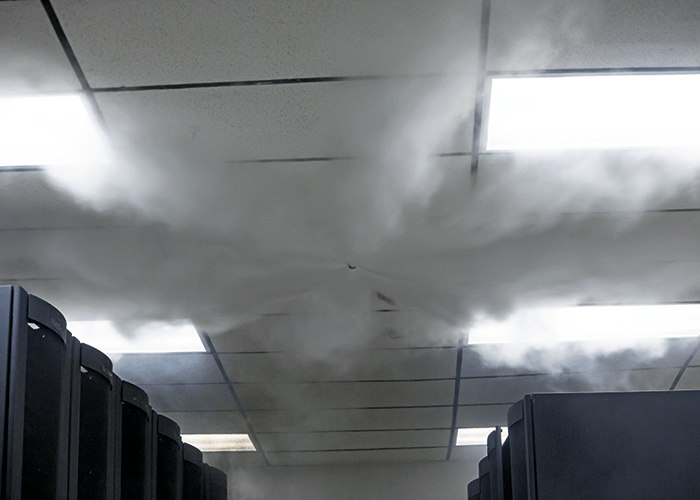 Novec 1230 fire protection fluid from 3M, being dispersed into a data centre. Inert gases are generally mixtures of argon and nitrogen and work by removing oxygen from the protected area. In order to do so, large quantities of gas are required to displace the air (and reduce oxygen). Due to the larger volume of gas necessary for extinguishment, the standards that govern inert gas use allow for longer discharge times, up to 2 minutes, plus time to extinguish a fire. High pressure cylinders are used to accommodate the larger volumes of gas. Additional safety measures and more rigorous maintenance schedules are used to manage the hazards of these higher pressures. For instance, over pressurization vents need to be installed, at owners’ expense, to preclude damage to the enclosure that is being protected. It is also important to note that storage of this large quantity of agent has a significant cylinder footprint (and weight) even when stored at 300 bar. Inert gases are clearly sustainable in that they do not have a meaningful impact on the climate. They will play an important role in enabling an HFC phase-down. It is important to make the distinction that, while the category of clean agents does include HFCs, it also includes a sustainable solution, fluoroketone (FK 5-1-12). FK-5-1-12 (commercially sold by 3M as Novec 1230 Fire Protection Fluid), is differentiated from HFCs in that it has no ozone depletion potential and, relative to HFCs, reduces climate impact by more than 99%. On that basis, FK-5-1-12 is not affected by the F-gas Regulation and devoid of the uncertainty that plagues HFCs. FK-5-1-12 has been sold into the Middle East fire suppression market for the past 10 years and adopted as a standard specification by major entities. Like other clean agents, FK-5-1-12 does not conduct electricity and will not damage sensitive electronics, nor leave a residue after discharge. This means that fires involving energised electrical equipment can be extinguished without powering down, helping to avoid expensive service interruptions and data loss. FK-5-1-12 works by removing heat (rather than oxygen) and acts fast – systems discharge within 10 seconds and extinguishment within 30 seconds. Systems using FK-5-1-12 use almost 10x less gas than inert gas systems and operate at pressures significantly lower (25bar to 50bar) than inert gases. As a result, systems using FK-5-1-12 use significantly fewer cylinders and do not put rooms at risk of over-pressurization. In occupied spaces human safety is clearly paramount. Industry standards establish both the agent threshold concentrations for human exposure and the design concentration used for protecting valued assets. The NOAEL (No Observed Adverse Effect Level) is the standard recognized limit for the various extinguishing agents. The margin of safety for humans arises from the relative difference between the design concentration and the NOAEL for a given agent. FK-5-1-12 (3M™ Novec™ 1230 Fire Protection Fluid) offers the highest human safety margin of all clean agents, making it ideal for occupied spaces. The global regulatory landscape is changing, fast. When evaluating alternatives to halons and HFCs for protection of valuable assets, it is important to look at overall total cost-of-ownership. This includes hidden installation and maintenance costs, cylinder storage costs, safety and the effect on business continuity over the life-time of the system. Clearly, there are many factors to consider when choosing a fire suppression system – not least of which is the protection of valued assets. The global initiatives to phase down production of HFCs are having a significant impact – but fortunately there are sustainable, cost effective and proven solutions readily available to substitute for HFCs and reduce the future climate impacts of the fire suppression market.